These perfectly straight trenches were dug by molecules of gold. Under just the right conditions, gold will act like a mini-snow blower. It will pry molecules out of a material, puff away the detritus, and then move on to the next. One day, we could use this to make entire labs on a chip. 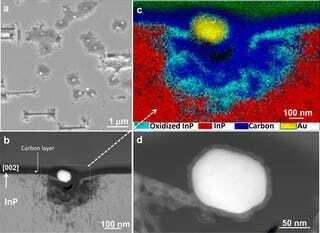 Scientists at the National Institute of Standards and Technology (NIST) and IBM were trying to make gold-alloy nanowires by laying down gold particle onto indium phosphide. But water kept getting into their experiment, and preventing the formation of the very nanowires they were trying so hard to construct. 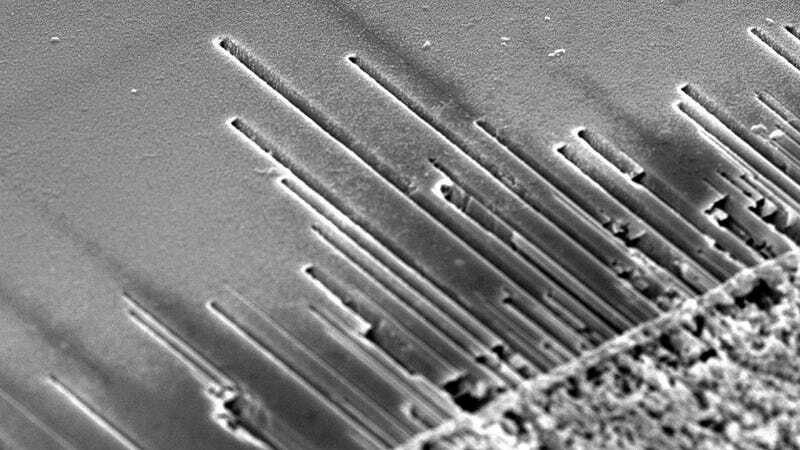 A closer look under a scanning electron microscope showed long regular grooves in the indium phosphate. How could that happen? The researchers found that the gold molecules themselves were digging the grooves — a process described in a paper published today in Nano Letters. The process starts when the gold and indium phosphide form an alloy. After it’s heated, the gold alloy breaks up into little particles. When water gets into the system, the alloy covers itself in a thin film of water molecules. Water molecules, particularly the oxygen inside them, can interact with the indium phosphide. This process starts at about 300 degrees Celsius, at which point the gold-alloy particle digs a little pit for itself in the indium phosphide. When the heat hits 440 degrees, the pit isn’t enough. The oxidized phosphorus and the indium evaporate, and the big gold alloy particle moves on to the next particle of indium phosphide. This, in turn, also becomes oxidized and evaporates. There are limits to the process. Water has to be introduced at the right time, after the material has already been heated. Groove-digging only occurs when the particle is under 100 nanometers. Thicker particles dig more slowly than thinner ones. There are also coatings that the research team can apply to slow or stop the growth, if desired. Someday, engineers could use particle size, water introduction time, and coatings to etch precise patterns on semiconductors. The scientists hope that this might someday contribute to “multifunctional heterogeneous nanosystems”—in other words, tiny chips that have many different uses. We might use these specially designed chips to analyze multiple aspects of a blood sample, scan the DNA of a single cell for problem sequences, or predict genetic expression in plants.